I'm going to join a gym again. The last time I set foot in one was in 2013. I worked out at home plenty, until Trimester 3 of my pregnancy adventure, and the past half year since his birth, working out has been sporadic at best. Since I set a goal back in April to work out at least once a week, I've actually made good it, sometimes even twice a week. This is but a small fragment compared to my former life, documented on this blog and even before the blog. Realistically, I don't think I'm going to be a "regular." My goal is actually 3 times a week. Having a gym near my new office makes it possible for me to work out during the work day, because let's face it, all bets are off once I see my sweet baby. Getting this part of my life in order has been a pipe dream of mine. Now that I'm settling into a new job and my pumping needs hopefully on the downslope now that Baby Tuesday has started eating (and is pretty darn good at it), I figured it is time to start picking up the pieces of my pre-baby life. Oh, and I've been sleeping a bit more lately (more on this later, perhaps), which helps. I only have 30-35 minutes of real workout time, so now I gotta figure out/re-learn how to make them count. Also, I started reading again. I wasted so much time Googling baby stuff in the early days, but now I have hit a stride and have a little downtime to look into which books I want to read again. I mostly read when I pump, which adds up, I guess. I also realize I'm behind on some reviews. I was sent this new Neutrogena sunscreen, which feels less sticky than other sport sunscreens. 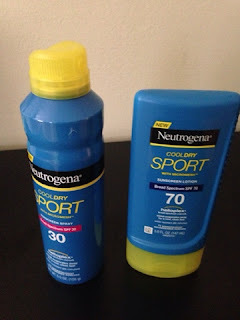 The weather has been on the cooler side lately, but sunscreen is still important. This sunscreen is available in both spray and lotion formulations, both available in SPF 30 ($8.99) and SPF 70 ($10.99). On the bar front, I was able to try these new PowerBar Triple Threat bars. In the past, I stayed away from this brand due to its very... protein-y taste, but these are actually pretty tasty. For the gluten-free people out there, they also released a Harvest line that caters to the gluten-free inclined. Although I haven't been logging anywhere near my old mileage and would suffer from calf issues, I still like wearing these SLS3 butterfly compression sleeves when I work out because my calves are weak from inactivity. When I jump a lot, they start to feel tight, so the sleeves definitely help. Plus, they are pretty fashionable for what they are. 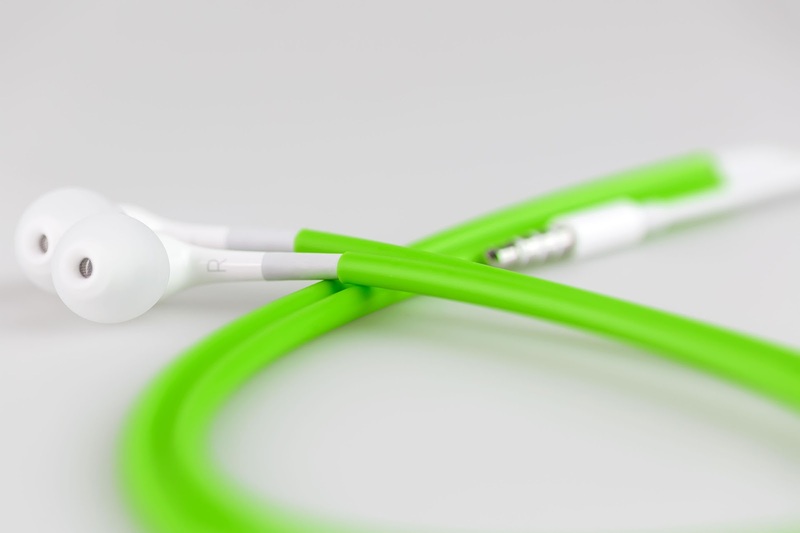 Also in my review queue is Cordskinz, which are like a plastic shield that keeps your earbuds from tangling up in your bag. I've had many a headphone sets die because of tangling and untangling, so this is welcome. Since I'm using the ones that come with my phone, they don't tangle a lot, but these Cordskinz do give them a cute new look. 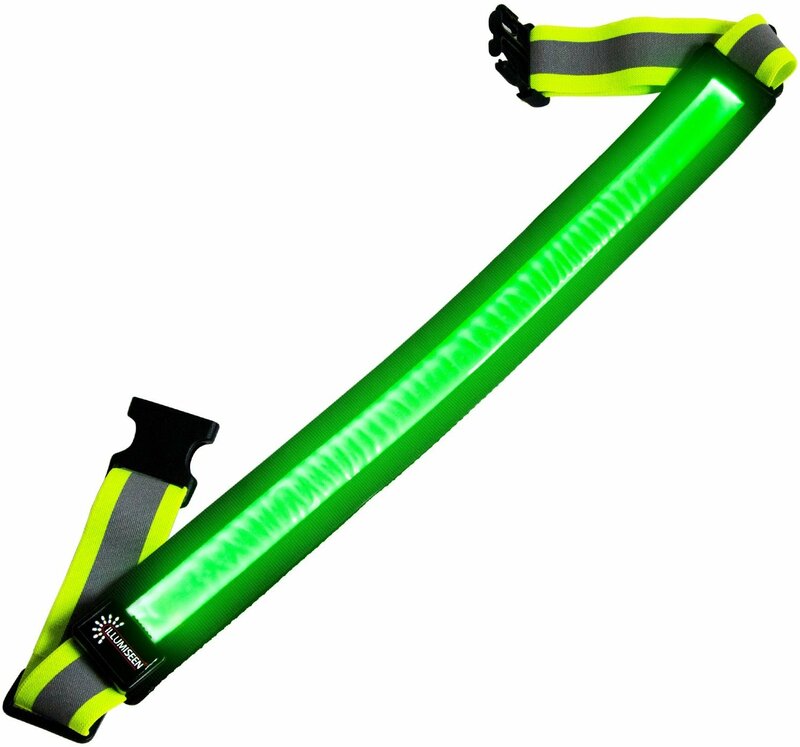 Finally, I was sent an Illumiseen LED belt, which is pretty awesome because it's legitimately bright and won't die out over time. With the weather getting brighter earlier and staying brighter later, I haven't had a chance to use this often, but I would imagine it would be helpful when I run/walk around the neighborhood in darker times. It is adjustable and doesn't bother me much wearing it, which is important. Well, that's all I've got for now. FTC Disclaimer: I was sent a sample of these products and was not otherwise compensated to provide a particular opinion about them. A while back, I posted about my current lack of exercise and vowed to work out at least once a week. The good news is, I've been sticking to that goal fairly well and have been squeezing in 15-30 minutes in a couple of times a week, along with walking that I get in during the daytime at work. There isn't much intensity in my workouts, and I definitely am not making any progress on the weight front. However, it's something, and when you effectively have not slept in six months, something is better than nothing. Prolonged sleep deprivation has done a number of things to me. For starters, besides exercise, food and eating, which were "up there" in my hierarchy of needs, is not as exciting to me anymore. Actually, few things are exciting to me anymore, and that is pretty sad. Given the choice between pretty much anything and sleep, sleeping wins, except I am terrible at sleeping during daytime hours, not like I have that luxury for the most part, anyway. Around Baby Tuesday's five-month mark, I gave up and started co-sleeping. I thought I gave it a good go trying to get him in his Pack N Play and then his crib, but after five months of frequent wakings and two of those months trying to swing those frequent wakings with a full-time job+commute and trying everything, I broke. And while the wakings are still frequent, at least I don't have to spend as much time resettling both of us before going back to sleep for a fragmented part of time. I know/hope it will get better, but "better" is taking a lot longer than I thought. I've fanaticized about knocking myself out just so my body can rest for longer than two hours at a time. I've had to start using an eye roller to fix what it cannot fix, and I've become used to a chronic jaw- and head-ache. I started a new job recently, and I feel bad that I can't give that, or pretty much anything, my all. Most of the time, I feel like I have nothing to give. So if my updates and product reviews are delayed, this is why. Not that I feel any obligation to post frequently, but blogging is one of my last remaining hobbies and pretty much reflects my current state of health. I'm hoping to get caught up soon.